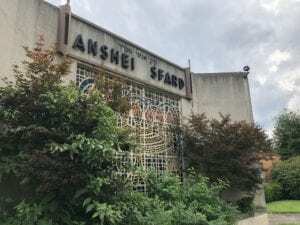 The Anshei Sfard case, which had been holding up the sale of the synagogue to the Jewish Community of Louisville, has been settled. After more than a year of debates, council votes and a court challenge, the Anshei Sfard property dispute is finally settled. That means the Jewish Community of Louisville can proceed with its plans to purchase the synagogue at 3700 Dutchmans Lane to expand The J campus next door. “This expansion ensures we develop a true campus that will serve the community for generations to come,” JCL Presdent and CEO Sara Klein Wagner said. The plaintiffs in the case, who wanted to see the synagogue protected as a city landmark, have dropped their appeal after a circuit court judge dismissed the case. “Regardless of our differences, it’s time to work together towards a greater good tomorrow,” Avram Kahn said. Anshei Sfard President Myrle Davis cheered the news. Jon Fleischaker, chair of the JCL Board of Directors, expects the sale to be finished sometime before June. What happens after that, he couldn’t say. “Obviously, we’re committed to keep the mikvah in operation until it is relocated, and we will cooperate with the Vaad (the owner of the ritual bath) to keep it operating,” Fleischaker said. He said the ultimate use for the real state remains a topic for discussion.